Once upon a time there was a cave full of sweaty, tired monkeys. Most of these monkeys sat at noisy machines, repeatedly pressing small buttons. A few others scribbled on pieces of paper or quietly mumbled to each other. They did all this when the sun was in the sky; when it went down, they usually returned to their dens, though not always. Sometimes these monkeys were not happy. Sometimes they shouted at each other. Sometimes they pressed the wrong buttons and their machines made funny sounds. Sometimes, when they were walking back to their dens late at night, they looked up at the moon and wondered why they were doing all this. A long time later the same moon was shining on the home of a tiny lynx-kitten called Epiphany (lynxes have strange names like that). Epiphany was still too young to go hunting, but she liked to explore the area around her home, and one day when exploring she found a strange machine. It had a little slot where you could slide in some other strange things made of plastic and metal, like little boxes – and then when you pressed a button it turned on and you could play games! What a very strange machine this was. Epiphany had found the machine on a big heap of weird objects that someone had left in the forest. She was seeing more and more of these around, and she often wondered what they were. This was the first time she had found something useful in one of them. She took the machine and the little boxes and went back home. Later that night she started playing one of the games that she had found on the heap. It was all about being an adventurer stranded on a mysterious island with a huge egg on it. A huge egg! She had never seen anything like that. It was a game all about exploring and finding secrets and helping people, about being brave and clever and good. And you could have a boomerang! She’d never even heard of a boomerang before, but it was great. You threw it and then it came back to you! She spent hours running around that island, exploring caves, cutting grass, collecting seashells, and saving up to buy a bow. She came closer and closer to solving the mystery of the big egg on the mountain. It was very exciting. But then the machine stopped working. Epiphany tried everything to get it working again. She so badly wanted to see the end of that game, and there were more little boxes with games in them to try out. Maybe they would all be this good! But the machine simply wouldn’t work. Once the screen turned on, but it was all grey and faint, and then it never turned on again. When her mother returned from hunting at dawn, she found Epiphany curled up around the strange machine and crying. After a few days had passed and every attempt at reviving the machine had proven fruitless, Epiphany decided that if she couldn’t complete the adventure on the machine, she would complete it in real life. She would grow up to be a hero, to help people and fight evil. With a boomerang. One day, many years later, she was travelling through the Lands of Dream, and quite by accident she came across the very same island from that game. The egg was even bigger than she had thought it would be. Oh, to find out what it was! She quickly ran up the mountain. In front of the egg there sat a monkey. “What are you doing here, monkey?” she asked him. So Epiphany told him her story, how she was here because somewhere in a smelly cave some monkeys had made a little box out of plastic and metal, and in doing so had inspired her and changed the course of her life. This made the monkey happy, and it went off to do some more scribbling. Epiphany could finally face the mystery of the egg. Turns out it contained a windfish. Like chicken and tuna in one. It was delicious. 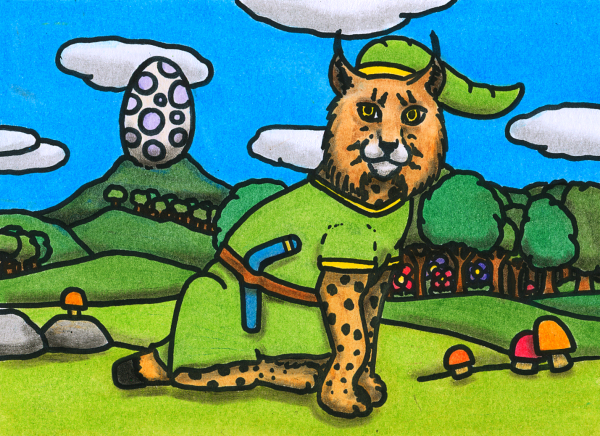 This entry in the Oneiropolis Compendium was made possible by Kim Blake.